Most of my readers are aware that my son has Aspergers. This means he likes to keep a schedule and tends to panic if he's off of it. He gets overstimulated easily. It's hard for him to fit in. When talking to his peers, he'd prefer to talk about his latest obsession. It doesn't occur to him that others wouldn't want to hear all about cumulus clouds. It's difficult for him to read people's expressions. It's why I connected to Don Tillman, the lead character in the book The Rosie Project by Graeme Simsion. Don never comes out and says that he has autism but a lot of his mannerisms certainly match up with having it. I saw my son Tommy in Don. I rooted for Don, just as I root for Tommy. If you like The Big Bang Theory and enjoy Sheldon, you'll love Don. I love how when meeting people Don says, "Greetings," instead of the "normal" hi or hello. If Don agrees with something, he doesn't say "yes." He says "correct." A lot of Don's quirks are my son's quirks. Who wants to be normal anyway? I giggled through so much of this book and now I want to say "Greetings" instead of hello. And no, I was not given a free copy by a publisher. I got the book from the library and loved it so much that I wanted to share it with all of you. 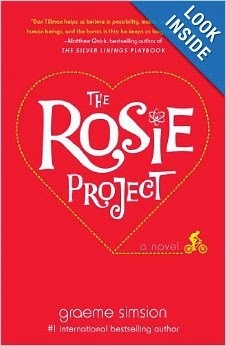 You can purchase The Rosie Project on Amazon here! If you read the book, let me know how you liked it. “You’re unbelievable," said Rosie. "Look at me when I’m talking." I kept looking out the window. I was already over-stimulated. That book sounds good - I like that "Greetings!" Another one to add to the list!! Thoroughly enjoyed this optimistic book, good for a little self reflection without being judgemental. Funny and sweet at the same time.